Remember those Totino’s® Pizza Rolls before going full GF? Well, we think it may be back on the menu thanks to the culinary curiosity of MI Gluten-free Gal! Here are some further tips from Margaret when it comes to preparing these scrumptious appetizers. 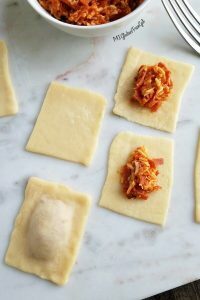 The key is not to over stuff them with the filling (so they do not leak), and to press the air out of the ‘ravioli-like’ squares, sealing from the center out. 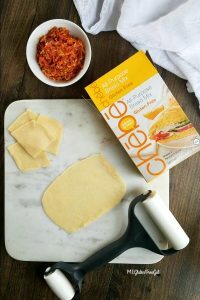 Her recipe and photos are duplicated on this page. If you would like to see the original on her page, the link is below. Our hats are off to Margaret! Chop pepperoni into small slivers. In a small bowl, mix pepperoni with cheese and sauce. Set aside. 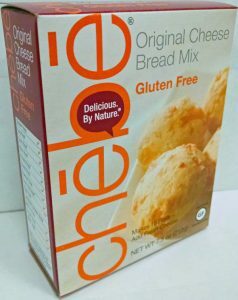 Prepare Chebe mix according to package directions. If mix still dry, add more milk (or water) 1 tsp at a time until dough ball comes together. Working with one small dough ball at a time, roll into a rectangle, approximately 4x6. Dough will be thin, which is what you want. This crust will puff up. 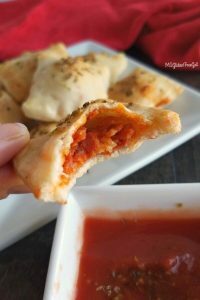 Cut rolled dough into four smaller rectangles, topping two with pepperoni filling. Use other two pieces to carefully top the topped portion. Next, carefully and thoroughly pinch the sides together. This is VERY important, or else the filling will leak out. Press the edges together thin if needed, than push / square the sides up with a straight edge. 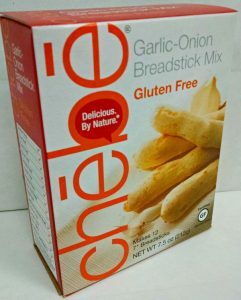 Place finished gluten free pizza rolls on a cookie sheet that has been lined with parchment paper. Repeat with remaining dough. 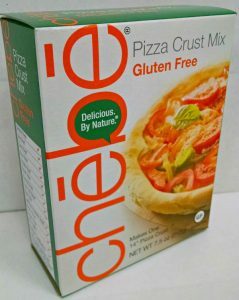 Each small dough ball makes 2 gluten free pizza rolls, times 12 dough balls, equals 24 servings. Preheat oven to 400 degrees. 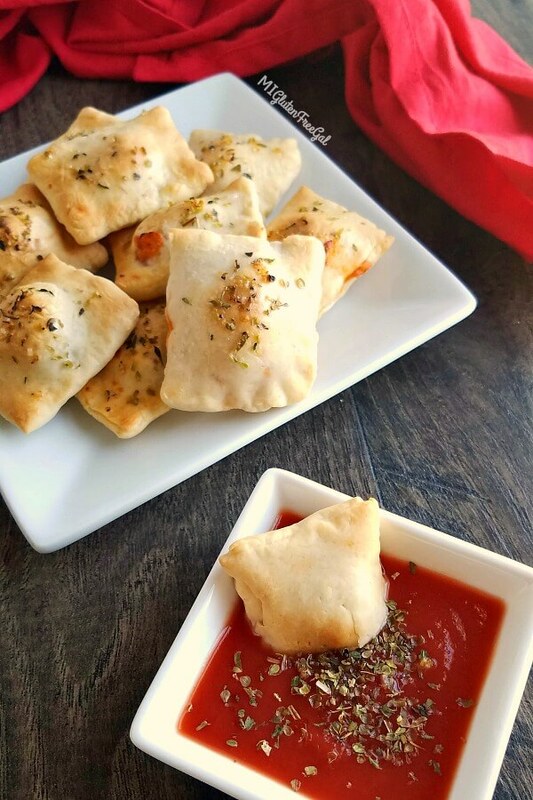 If desired, brush pizza rolls with melted butter and top with pizza seasoning. Bake for 8 minutes, then flip and bake for an additional 8-10 minutes. Allow to cool slightly , but best served warm.